A guy who spirited himself away from the shores of England to settle in the glorious land of Berlin mid 2009. Has been avoiding Gluten like the plague for the past 5 years. A dedicated photographer. Lover of all things cafe and coffee related. Lover of all things doggy. Desperate to stuff his face with as much Glutenfrei loveliness as he can find. Thanks for the head start on this research! I will be in Berlin for a few months in Summer 2011 and my husband is gluten free! Nice work, this looks very promising! Hi, Just want to thank you for writing these reviews, I’m planning on travelling to Berlin later this month for a few days and was initially struggling to locate gluten free restaurants and products however, you have put my mind at rest, as I am especially looking forward to eating at the pizzeria you reviewed. Thanks glutenfreiberlin for the great reviews, I visited Berlin for a few days late last month and your recommendations were excellent, especially Simela Pizzeria near Savignyplatz, loved ithe pizza so much I went back on two occasions. I’m jealous that you live in such a great city and hope you keep up the great work. I’m so happy I found this website :D! My dream is to open a glutenfree café myself as I studied hotel-management and worked as a barista as well and stuff…. But it has to wait for a few years I guess! Anyway- have you been to Cupcake in Friedrichshain yet? They are really lovely, usually you have to pre-order your glutenfree cupcakes but then you would have to order 12 at least or something. I just walked past one day and went in just to ask them about gf stuff and they said they always have the Schär-Muffin-Bases (if you didn’t pre-order) and I was able to choose the topping! Yum! And it’s the same price as the “normal” ones :)! Thank you so much for your great website :)! You should definitely open a gluten free cafe, the city needs one! I’ve not been to Cafe Vux much myself, I had a reaction to their cakes but they did assure me that their gluten free offerings do not have any spelt flour inside them. But that is definitely something to watch out for here, a lot of people don’t see the distinction between wheat and gluten. Haha you’re right about ordering 12 Cupcakes! they got a lot of gf stuff! Even freshly baked, yay! I might be traveling to Berlin this year & I can’t wait to try some of your recommendations. Thanks so much for all the great info!!! Fantastic blog and a ton of help for us before we travel to Berlin this autumn! One question: do you know of any B&Bs/small hotels that can offer gf alternatives for breakfast? We are a family of four with one gluten- and milkfree and one gf/vegetarian. TIA! Hi, I’m not aware of any that specifically offer gluten free options, some may have a buffet brunch/breakfast though (you can get this all over the city on weekends too, its a bit of a berlin thing to do) where at least you can see the food, ask about specific items and pick what you want and don’t want. Or there are plenty of breakfast options in shops to buy and bring back, the vitalia in alexanderplatz s-bahn station has a few, porridge, corn flakes, cracker bread etc. I’m pretty sure they have lactose free milk and cheese too (lactose free stuff is much easier to find here than gluten free). We are going to visit Berlin this month and I’m very happy with all the restaurant options. I only knew the Maredo steakhouses, which have a whole table with all possible allergens listed and checked per ingredient per dish. I saw them on your gluten free map. Oh and at the (Dutch) livaad website the restaurant QAnh is also mentioned, it is at the Schonhauser Allee 140 and it is a Vietnamese restaurant where everything is gluten free. Do you know it? Hi, thanks, glad to be of help 🙂 I’ve not heard of QAnh before, but oddly enough I was across the road from it when I read your comment. I had a quick look and it seems to be ok, I didn’t have time to stop and check fully but they have the usual fair of vietnamese dishes with rice and noodles (rice/bean based). There are quite a few vietnamese places in that area and they’re usually pretty good, just the matter of checking that they don’t use gluten based fish/soy sauce in their cooking. Thanks for the tip, I’ll be checking it out in more detail soon. Good luck with your visit! hey, great blog. i have spent the last year building up my sources for gf eating in berlin. too bad i didn’t see this earlier. i have a prenzelberg tip for you for cookies. berlin seems to be quite behind the times, doesn’t it. did you notice the dozens of frozen yogurt cafes that popped up around mitte this summer. coming from the states, i had to laugh. frozen yogurt is great and all, but people it is 2011 not 1995. It’s me again. I discovered something new, yay! It’s called Goûter and it’s french. It’s located in “Kreuzkölln”, Reichenberger Straße 143. They got glutenfree bread which is absolutely amazing (you can keep it in the fridge for about one week, 1200gr for 9,50 I think!). You should probably order it first just to be sure they’ve got it! Sometimes they also have some glutenfree stuff like cake or quiche and the owner told me it just happend by accident, he’s not a celiac and he doesn’t know everything about it but he was really interested. He was also really concerned cause of course he makes all the other cakes etc. in his kitchen with “normal” flour but I told him thats ok he should just tell the gf people. If they don’t have the bread or cake they always have macarons which are glutenfree by nature. And you can ask him anyway about the ingredients cause he makes everything on his own :). Wow. Really helpful blog. 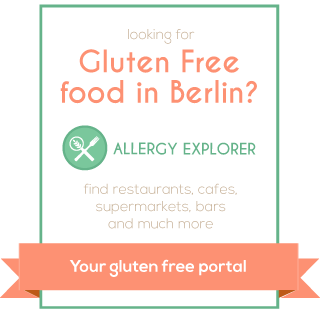 I’m heading to Berlin in a few weeks and was wondering if you knew anywhere that served gluten free beer? Also, do you know of any German brands that I might be able to buy in the supermarket? There’s only one bar that I’ve heard of, but I’ve not been myself yet, it’s listed on the googlemap, and a lot of the vitalia organic mini markets sell beer if you want to buy it yourself. Probably the best brand to look out for here is Schär, they’re easy to spot as they’re usually in the bright yellow packages. Have a look at the product reviews section for a couple of them. Thanks very much for that. I’ll let you know how I get on. I found out that I have a so-called “Glutenintoleranz” two days ago. After discovering this great website, I feel less desperate and less annoyed! AND the site is in English. Thank you so much. I have found so many options ‘close to home’ already!! I went recently, it’s great to have another pizza place here, thanks for the tip. We visited Berlin last week in no small part due to your website. I cannot thank you enough for all your research and the map. Wherever we were, I knew there were options for me. Now I know they were delicious options as well. All the best to you. I’m so glad to find gluten-free bloggers in other countries. I love to travel so this is so useful! I’m going to be living in Berlin for almost a year starting this February – I am SO happy that I found this blog. Thank you so much for making it, I’ll definitely be referring to it often. Happy Holidays and be well! Great blog, especially your reviews make me smile 🙂 I have heard of a Creperie in Prenzlauer Berg, where they offer Galettes, do you know about that or even tried it yet? We all love you man!! keep on the good job! I have to Karun in Charlottenburg, It’s mainly a Persian/Arabian Bistro but they have almost 80% of the foods made there are naturally glutenfree. The owner is well aware of Gluten, and cross contamination. Thank you so much for this website, that really helps! Has anybody any experience with gluten free beer (draft) in Berlin? Loving the blog! Thanks so much for the info! Wow, you’re doing such a wonderful job. Thank you so much! Your blog is highly appreciated. Hey, I’ve been tasting your recommendations for some time now, and they are all really great, thank you for gathering all this info:))) BTW, I have found something I believe deserves a shot: Prinzessinnengarten at Moritzplatz. It is a great place to visit+ has vegetarian gf meal (a very tasty, reaction-free one:)…hope you will enjoy it! I can definitely recommend Cha Cha in Friedrichstrasse- the baby spinach Salad and the very spicy chicken curry were delish! There is a place near the Ku’damm Bart called Dean&David that offer gluten free salads and curries. All fresh ingredients. It’s a chain, but an organic one. at Brunnenstraße 164, 10119 Berlin is one vegetarian/vegan place called Chay Viet. The first page of the menu tells that you can also order your meal gluten-free. Tasty tasty! Problem – I am driving my elderly mother from London to Berlin to sing in a Choir in the Berlin Concerthaus. She has rehearsals until 11pm and then she needs to eat. We are staying in the fredrichstrasse area and, oh yes, she is a coeliac!!! Answer – 5 minutes on Glutenfreiberlin and we have found a steak restaurant which does exactly the kind of food she likes and is open to midnight. Hey! I was wondering if you know if any of the places you reviewed might be willing to do a last minute custom order. The American food-lovers holiday Thanksgiving is just around the corner and I had a gluten free friend coming, everything but desert I can make gluten free myself. Thoughts? Thanks for having this blog and helped me. Tomorrow we are going to Berlin with friends and to have this information beforehand is amazing! And, I laughed a lot by myself reading your comments, I usually have this thoughts on my mind… Cheers from Barcelona! Great blog… Literally a life saver! Thought you might enjoy this restaurant. It’s a guaranteed gluten free environment. The food was awesome and it also had gluten free beer (http://www.essenfassen.com/index.php?id=97 or http://www.tripadvisor.in/Restaurant_Review-g187323-d1341080-Reviews-Essen_Fassen-Berlin.html). Also, don’t know if you realize but most Thai and Indian curry’s are naturally gluten free. The only time they’re not is if they’ve been thickened with wheat flour (this is pretty rare, but worth checking with the waiter before). Found this to be a great option when eating out in Berlin. Thanks for the comment, unfortunately Essen Fassen closed its door this summer. I believe they moved to southern Germany. Thanks so much for this! I am visiting this December with my boyfriend and I am so excited that we can go out for dinner and find cafes with things to offer 🙂 Just a question, will I be ok trying to get by explaining in English? Or should I equip myself with lots of phrases? Obviously I will try and do this anyway but I’m hoping that if all else fails and I resort to English that I have a chance of being understood. Thanks! Hi, thanks! I’m glad to be of help. For the language, it really depends upon where you are and who is serving you on that day. Knowledge of gluten here still isn’t great so you often have people telling you there is no gluten in food when they have no idea what gluten is. The best bet would be to print out one of the translated travel cards that explains everything in great detail to hand out. Or, just stick to the places I’ve reviewed on here. Even if it’s far to travel to a place, it’s often worth the trip rather than trusting a more local restaurant to make something gluten free. Hello. I’ll be visiting Berlin this coming weekend and was delighted to find your blog. Thanks for writing it. This is a great, wish I checked it BEFORE my Berlin visit! This might be a good addition: Cafe Simply Keto, they have great cakes, pies, cookies, ALL Gluten free (visit April 2016). They have all kings of GF and Vegan products for sale as well.